Apple facts, an information sheet for kids cooking activities with apples. Apple facts and general information about apples. 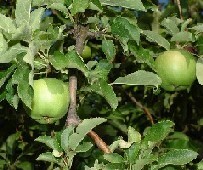 Depending on the variety of apples, they are harvested fresh August through September and October. They can be found in the grocery store throughout the year. Apple Trees blossom in the spring and the blossom grows into an apple by autumn time. Pick apples that are firm and well-colored. Avoid shriveled, bruised or soft apples. Store apples in the refrigerator. They can be stored at room temperature but will soften faster. Dont store with green vegetables and salad greens because of ethylene gas that apples give off can damage the vegetables. Apples can last up to 6 weeks in your fridge. Wow! There are so many ways to cook apples. Shredded in quick breads, chopped in apple pies, whole in baked apples, eat as is! 1 medium apple is one serving. 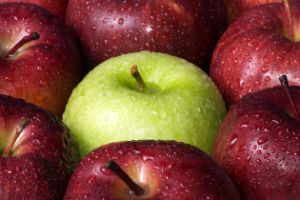 Apples are high in fiber and Vitamin C. They also contain potassium, antioxidants, iron, calcium and Vitamin A. Add ingredients together in crock pot. Cook on low 10 hours or until deep brown color. If youd like a smoother texture, run through the blender. Freeze in containers. You can also mix varieties of apples for your 8 lbs. Enjoy! Core apples half way. In a microwave safe dish, place cored apples. Place red hots and mini marshmallows into the center of each apple. Cover with plastic wrap. Cook 5-7 minutes. Turn apples and cook another 6 minutes. Let cool about 5 minutes. Drizzle each apple with caramel sauce if desired. Serve. Cut the apple in half, cut out the core, scoop out the seeds and place the halves in separate bowls. Sprinkle the cranberries evenly over both halves of the apple. Sprinkle each apple with brown sugar. Place 1 tsp of margarine onto each apple half. Cover the bowls with plastic wrap leaving a little of the bowl uncovered so steam can be released. Microwave on high for 3 minutes or until the apple is just beginning to soften. Sprinkle with the granola before serving. Visit our seasonal cooking apple recipes page for more ideas. Return to food facts sheets from apple facts.